Volgograd: what’s in a name? Volgograd has had many incarnations, but is best known as Stalingrad for the great WWII battle that raged in and around the city. Local journalist Oksana Zagrebnyova gives a wry update of life in Volgograd in the run-up to the Duma elections and the city’s relative indifference to a possible change of name, when all the residents want is a normal life with a working infrastructure. I’ve thought many times that the name ‘Volgograd’ probably means nothing to foreigners. They only know the city of ‘Stalingrad’, insofar as the Battle of Stalingrad is mentioned in history textbooks as one of the turning points of the Second World War. Some are even surprised, when they look at a modern day map of Russia, to see where this renowned Stalingrad city actually is. In the beginning the town was modestly named ‘Tsaritsyn’ [possibly from Turkic sary-sin or yellow island] and this lasted for 3 centuries. In April 1925 the VTsIK (All-Russian Central Executive Committee) of the USSR decreed that it should be renamed. It is said that the idea of ‘Stalingrad’ belonged to the then Premier and Chairman of Sovnarkom (the Council of Peoples’ Commissars), Alexei Rykov. This did nothing to save him from execution in the years of the Great Purges under Stalin. In 1961, when Nikita Khruschev was fighting against the Stalin personality cult, he ordained that the name with its links to Stalin should be wiped off the map. He was not deterred by the fact that in 1942 he himself, as a member of the Supreme High Command General Headquarters, had for six months been at the epicentre of the great battle. Local authorities explained to him that residents didn’t look upon the city’s name as a ‘memorial to Stalin, but saw in it a symbol of victory and a symbol of the state’s power’, but Khrushchev was not be persuaded. However, it was decided not to return the old name Tsaritsyn to the city because, in the eyes of the Party leadership, it was too reminiscent of the Imperialist past. In November 1961 it was ‘Volgograd’ that appeared on the map of Russia. Only a few buildings have survived from the time of Tsaritsyn, since the city was practically wiped off the face of the earth during the Second World War. It was rebuilt and now the architecture in the central part of Volgograd is Stalinist Empire-style: monumental five-storey buildings with stuccoed facades, and administrative buildings with columns. General Field Marshal Friedrich von Paulus (first on the right) was captured in the cellars of the Stalingrad Central Department Store. Following his arrest he was interrogated by the Soviet Marshal Konstantin Rokossovski (second on the left). Volgograd’s history takes hold of its visitors while they are still on the platform at the Central Railway Station. Tourists have hardly left the train when they find themselves in the Square of Fallen Soldiers, with its eternal flame burning, and schoolchildren standing in the centre, paying tribute to the memory of the city’s defenders. There too is the Central Department Store. On 31 January 1943, two days before the end of the Battle of Stalingrad, the command staff of the southern detachment of Hitler’s troops, headed by General Field Marshal Friedrich von Paulus, was captured in the cellars of this building. Also in the central part of the city is the panorama museum ‘The Battle of Stalingrad’. In its grounds stands the legendary ‘Pavlov House’, a simple, unremarkable Stalingrad building, marked on Field Marshal Paulus’ personal map as a fortress. At the time of the battle in Stalingrad, every building was fought over. For almost two months, Pavlov and a handful of soldiers held their line. Because of their courage, the Pavlov House became an impenetrable stronghold. The main sight of Volgograd, and also the highest point of the city, is the ‘Mamayev Kurgan’ (literally, ‘Mamai’s burial mound’). During the battle, whoever occupied it automatically controlled almost the entire city, the surrounding area, and passage across the river. It was the site of desperate fighting and rivers of blood flowed there. The slopes of the mound were ploughed up again and again by bombs, shells and mines. The idea to construct a grand monument in Stalingrad to commemorate the great battle came about almost as soon as the fighting stopped. 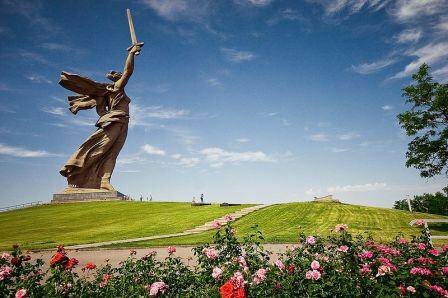 The central composition of the Mamayev Kurgan, ‘The Motherland Calls’, stands 52 metres tall and weighs 8 thousand tonnes. Crowning the mound is a figure representing the ‘Motherland’, which is visible from many places in the city. To this day, it is a tradition that newly-weds visit these historic places after the marriage ceremony to lay flowers at the monuments. In the 50s and 60s, it was probably an expression of gratitude to their ancestors for defending their native land. Now, however, young people are simply honouring the tradition. What’s more, it presents an opportunity to take beautiful wedding photos in the countryside. I, however, am no fan of wedding celebrations for a hundred people, so I didn’t have a white dress or lay flowers at the monuments. Twice a year, veteran participants of the battle on the Volga, their children and grandchildren, travel to Volgograd. This is on 2 February, the day the German troops were defeated near Stalingrad, and9 May, World War II Victory Day. As it says in the song, ‘The Day of Victory is a celebration with tears in our eyes’: for veterans it’s a time for joyful reunions and tragic memories. But with every year the number of participants on the celebratory parade becomes ever smaller. Somewhere I found the latest data that, in Volgograd and its surrounding region, barely more than 1500 participants of the Battle of Stalingrad are still alive. Sometimes I want to see today’s world through their eyes. Are they proud of their descendants? Do they like the country for whose future they fought? Incidentally, a year ago Russia marked the 65th anniversary of the end of the war, but to this day there are still veterans who haven’t received the housing they were promised by the government. How do our elders feel as they travel around Volgograd’s shabby streets, given that the authorities have still not managed to accomplish the most banal and necessary task of repairing the city’s transport infrastructure? In Volgograd only a few buildings have survived from the time of Tsaritsyn and Stalingrad, as the city was practically wiped off the face of the earth during the Second World War. Historically it came about that the city grew exclusively in length, as more and more factories were built along the bank of the Volga. The residential part of Volgograd also stretched along the river; the city is like a ‘gut’, as the locals say, narrow and long. It’s about 60 km from north to south, which takes one and a half hours in a car, whereas a train from east to west takes about 20-30 minutes. Everything is made even more complicated by the fact that in a city of a million people there is effectively only one road joining the southern and northern districts. That means that if there is an emergency on this main route, an accident, a burst water pipe or simply traffic gridlock, finding a way round the congestion is impossible. So, for example, a year ago, during a period of heavy snowfall, which doesn’t happen very often in Volgograd, the city literally came to a standstill. The situation was almost laughable: it turned out that the company responsible for clearing the snow didn’t have the right machinery because they had hired it out to someone and ‘forgotten’ to collect it on time. HGVs skidded on the slightest incline, and trucks veered across roads that hadn’t been spread with chemicals, and couldn’t move from where they ended up, blocking the road off to everyone else. All of this led to traffic jams several kilometres long. Yet, at the time the transport debacle was unfolding, the mayor of the city, Roman Grebennikov, was taking a break at a comedy show in the neighbouring region. The city authorities recently decided to charge lorries to drive through the city. I don’t know how legal this is, but I am 100% sure that it’s not going to solve the problem of our clapped-out roads. One of the reasons for this is that road construction today is one of the most corrupt forms of business in Russia. Recently I heard that 1km of road in Russia is more expensive than in any other country in the world. For the alleged cost of laying the road-bed, the same section could be covered with a layer of black caviar... However, in spite of the massive spending on road construction, it’s not obvious that there are actually any more roads, nor is their quality improving. Perhaps I will finish this theme of roads with a story about the ‘dancing bridge’. The bridge across the Volga stands on reinforced concrete supports. Just after it was opened in 2010, millions of people watched an internet clip of the bridge rocking up and down in the wind, as if it were made of rope. It looked most impressive: the range of swing reached one metre! Soon after its opening in 2010, millions of people watched a youtube clip of the new bridge over the Volga 'dancing' in the wind, as if it was made of rope. The bridge took a long time to build - 13 years - and it’s vitally important for the city. Getting to the left bank of the river, where the dachas and holiday sites are and where people live, was previously only possible on a little river tram or on a cargo ferry, which don’t function in winter, or via a diversion across the dam of the Volga Hydroelectric Power Station, but that’s no shortcut! Moreover, the bridge across the Volga in the city is the main road which links the Volga region with Astrakhan, Saratov and the whole of Central Asia. Of course, the bridge’s opening was awaited with trepidation, but the car-owners didn’t have long to enjoy it – after only six months, it began to ‘dance’ in gusts of wind of up to 16 m/s, and was closed. Five days later specialists were satisfied that the bridge was danger-free and it was re-opened, firstly for pedestrians and cars, and then two months later for lorries as well. The official version put the ‘dances’ down to wind vibration. All in all, the bridge is something of a mystery. No significant technological changes were made in the course of the year, but it no longer danced. Even though winds have since been even stronger than they were on that fateful day. Often, when watching some foreign film or news items about the USA or Europe, I envy foreigners in an amicable sort of way. Long suspension bridges across rivers, inconceivable viaducts and many-layered roads, highways and high-speed trains. I look at them and I feel almost as a person from a century of steam engines would, looking at the age of computer technology. And it makes me sad. However long I live in Volgograd, I never cease to be amazed by how slowly everything develops in the leisure and the services sectors, and the speed at which new housing is being built is fast approaching zero. I am no longer surprised when I recall the accusations levied by businessmen against the mayor, Roman Grebennikov, who was even expelled from the business organisation, ‘Business Russia’. He was accused of making life a nightmare for local businesses and the accusations were further confirmed by inspectors from the Prosecutor General’s Office. In particular, Volgograd businessmen were saddled with investment conditions that were patently disadvantageous for them, and with charges unrelated to their activities. Land allocations and permission to build and so on depended on the businessmen making so-called ‘charitable’ donations to the city. Not infrequently, while promising parcels of land to entrepreneurs, the mayor’s office actually forced them to carry out expensive works to their design, but then didn’t grant them the land. Who would want to work in those conditions? I don’t believe in fair elections (and I’m not alone in that), and I’ve had enough of all the pre-election political tactics, the politicians heaping dirt on each other and the revealing articles. It’s sad but true: people enter politics to solve their own personal problems, and not the problems of the people. I never liked Grebennikov, rather the opposite. In 2001 he became speaker of the regional Duma. He wasn’t yet 30 years old, and he became modern Russia’s youngest leader of a legislative assembly in any of the Federation’s autonomous entities. I remember my colleague, a radio correspondent, returning from a session of the regional Duma, and telling me how Grebennikov swore at deputies who were old enough to be his father. 4 years later, the parliamentarians, unable to put up with him, voted to remove him from the role of speaker. The ex-mayor is a peculiar and surprising sort of man. Over the three plus years that Roman Grebennikov was mayor of Volgograd, he acquired a not insignificant number of enemies. In the 2007 mayoral election he stood on the Russian Federation Communist Party ticket, and promised not to change his political orientation. But as soon as he won, he joined ‘United Russia’ and later headed Prime Minister Vladimir Putin’s community liaison office in Volgograd. The leader of the Volgograd Communist Party, Alevtina Aparina, seeing how her former colleague was running the city, publicly repented of promoting Grebennikov’s candidature at the election. The communists even collected signatures calling for his early retirement. New Volgograd governor Anatoli Brovko was appointed by President Medvedev in 2010. Everyone expected a change for the better when ‘United Russia’ representative Anatoly Brovkowas appointed governor a year ago. It was hoped they would find a common language, but the miracle didn’t happen. Grebennikov continued to accuse the regional authorities of not allocating Volgograd the necessary funding from the regional budget. Brovko in turn repeatedly asserted that the city should be governed by a city manager, who would be the right hand of the governor. On New Year’s Eve, Grebennikov’s political career cracked. He was first removed from his post as head of Putin’s community liaison office. Then, after a few months, the governor Anatoly Brovko dismissed him from his position as mayor of Volgograd for his failure to implement a range of judicial decisions concerning some of the city’s vital functions. His party colleagues then kicked him out of ‘United Russia’ on the grounds that he had ‘discredited the party’. During the almost 4 years he was mayor, criminal cases were regularly brought against officials of the city administration. Among Grebennikov’s ‘achievements’ was the abolishment of the traditionally free public transport for schoolchildren. Furthermore, it was revealed that the mayor’s office had purchased flats for the accommodation of orphans at an auction in which only one firm participated. By a strange coincidence, the founder of this single participating firm was Angar Politsimako, a deputy of the regional Duma, which leads one to wonder if the mayor had been receiving a kickback. From everything going on around him, one gets the impression that he is simply an official greedy for money and aware that he is untouchable. No more than 1500 veterans of the Stalingrad battle are still alive in the Volgograd Oblast. Many of them have not yet received apartments promised them by the Russian government. Now Grebennikov is trying to re-establish himself in his position through the courts, while an acting mayor has been appointed and deputies will decide in the near future whether to take on a contract manager to run the city. This will possibly even be better for Volgograd. After all, mayors elected by the people have not coped well with their duties and Grebennikov’s predecessor ended his career in the dock. What’s more, I don’t believe in fair elections (and I’m not alone in that), and I’ve had enough of all the pre-election political tactics, the politicians heaping dirt on each other and the revealing articles. It’s sad but true: people enter politics to solve their own personal problems, and not the problems of the people. On ballot papers you’ll either see names that no one’s heard of or names no one wants to vote for. So you have to vote for the lesser of the evils, and then you watch how the ‘lesser evil’ you’ve voted for is governing the city you live in. Most city residents are indifferent as to who will be in the driving seat – Anna Chapman or James Bond, an appointed city manager or an elected mayor. We simply want to live in a well-appointed city in a well-appointed country. There is no such thing as politics in Russia. Nor are there politicians. Even the elections to the State Duma have been turned into a farce. The absence of any politicians who are really ‘someone’ in our region makes it quite possible that we will be represented at the regular election to the State Duma by Anna Chapman, one of the protagonists of last year’s espionage scandal in the USA. She has already taken her first steps towards a seat as a deputy by joining ‘The Young Guard’, the youth organisation of ‘United Russia’. She visited her childhood home town, Volgograd, and went to see its local hospital complex, where she paid for the operation of one of its patients, chatted to students from the medical college and gave them money to buy equipment for a disco. She also met young business people from Volgograd. The campaigning has begun. A Volgograd political scientist predicted Anna’s destiny amazingly accurately. There was a lot of interest in her when she returned to Russia last summer and anyone who could, jumped on the bandwagon. The tabloids published more and more new details from Anna’s life, intimate details included. Volgograd caught this wave and pages of newspapers displayed interviews with Anna’s teachers, school friends and her ‘first love’. One of the publications even announced a competition for the best song about Anna and her spy colleagues. One political scientist said to me in a conversation that he wouldn’t be surprised if Chapman soon appeared among the candidates for a seat in the State Duma. What foresight! But this is all a storm in a teacup. Most city residents are indifferent as to who will be in the driving seat – Anna Chapman or James Bond, an appointed city manager or an elected mayor. We simply want to live in a well-appointed city in a well-appointed country. Where cars won’t end up in traffic collisions because of the potholes in the roads. Where there are leafy avenues and parks in which the whole family can relax and not have to walk along uneven paths paved last century to find a rubbish bin or somewhere to sit. We don’t want the hot or cold water turned off regularly in our homes, or rusty sediment and sand to flow periodically out of our taps in place of water because the plumbing system is 70 years old. We want there to be sufficient places for our children at nurseries and for parents not to have to join some fictitious queue to get these precious places. We don’t want to be forced to give up waiting our turn in the queue in despair and to have to offer the manager a bribe to take our toddler anyway. We want housing prices to fall, but if no housing is built, this won’t happen. We want investors to come to our city and build everything: shopping centres, supermarkets, sport complexes, cinemas and clubs, and we don’t want anyone to ‘wreak havoc’ on businesses. I almost forgot... Back when the Soviet Union collapsed, there was a great deal of support for bringing back the former historical names to Volgograd and to this day our communists are in favour of renaming the city Stalingrad. Nine years ago this matter was even sent up to the State Duma for discussion, but the majority voted against it. The proposition to return the city its old name Stalingrad has been rejected on a number of occasions, but the memory of the battle lives on. The Square of Fallen Soldiers with its eternal flame is located in the centre of the city. There is always a guard of honour and never a shortage of flowers. The writer Vasily Aksyonov proposed a return to the old name of Tsaritsyn. Volgograd seemed to him an impersonal sort of name, devoid of any meaning. “What does it mean? A city on the Volga? There are so many cities on the biggest river in Europe: Nizhny Novgorod, Yaroslavl, Kazan, Samara, Saratov...” fumed the prominent Russian writer. Incidentally, as a social survey showed then, around 60% of the population disapproved of the idea of renaming the city. Approximately the same number was suggested by later research. Maybe because many people understand that renaming a city is a rather costly indulgence. Photos: Volgograd Oblast Administration web site, Wikimedia.